When reading British literature published before 1971 one will encounter strange expressions for monetary units such as “farthing” or “florin” or, perhaps more familiar, “sixpence” or “shilling.” On February 15th of that year the United Kingdom changed its currency from the century-old duodecimal to the universally much more popular (because easier to calculate) decimal system. The new monetary metrics were introduced with the help of a huge marketing campaign including pop songs, children's games, and TV spots. “Penny/pence” and the “pound” have survived into our more modern times, all other denominations were lost. In the former system one pound consisted of 240 pence, with 12 pence amounting to one shilling and 20 of those to one pound again. Prices were accordingly denoted in a tripartite matter derived from ancient Latin: £/s/d = librum (pound)/solidus/denarius. So when you bought the last Beatles album, Let It Be, upon its first release as a stately box-set on May 8th 1970, its UK retail price was then listed as “£2/19s/11d” – a nonsensical sum one penny less than £3. Those were the days. Sort of a currency in scientific publishing is the seemingly ever-lasting Journal Impact Factor (JIF), with every publisher and author craving for ever-higher values. 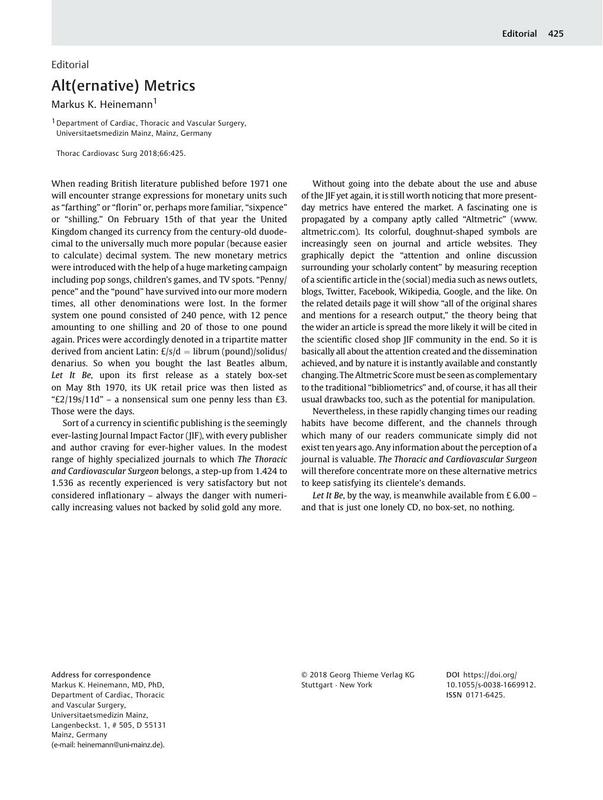 In the modest range of highly specialized journals to which The Thoracic and Cardiovascular Surgeon belongs, a step-up from 1.424 to 1.536 as recently experienced is very satisfactory but not considered inflationary – always the danger with numerically increasing values not backed by solid gold any more. Without going into the debate about the use and abuse of the JIF yet again, it is still worth noticing that more present-day metrics have entered the market. A fascinating one is propagated by a company aptly called “Altmetric” (www.altmetric.com). Its colorful, doughnut-shaped symbols are increasingly seen on journal and article websites. They graphically depict the “attention and online discussion surrounding your scholarly content” by measuring reception of a scientific article in the (social) media such as news outlets, blogs, Twitter, Facebook, Wikipedia, Google, and the like. On the related details page it will show “all of the original shares and mentions for a research output,” the theory being that the wider an article is spread the more likely it will be cited in the scientific closed shop JIF community in the end. So it is basically all about the attention created and the dissemination achieved, and by nature it is instantly available and constantly changing. The Altmetric Score must be seen as complementary to the traditional “bibliometrics” and, of course, it has all their usual drawbacks too, such as the potential for manipulation. Nevertheless, in these rapidly changing times our reading habits have become different, and the channels through which many of our readers communicate simply did not exist ten years ago. Any information about the perception of a journal is valuable. The Thoracic and Cardiovascular Surgeon will therefore concentrate more on these alternative metrics to keep satisfying its clientele's demands. Let It Be, by the way, is meanwhile available from £ 6.00 – and that is just one lonely CD, no box-set, no nothing.